Have you ever wanted to buy that special someone in your life a lovely new fragrance for Christmas but for the life of you have no idea what sort of scent they would like? You don't want to splash out on something that may end up sat in a cupboard for years? Well.... THIS is the thing for you! 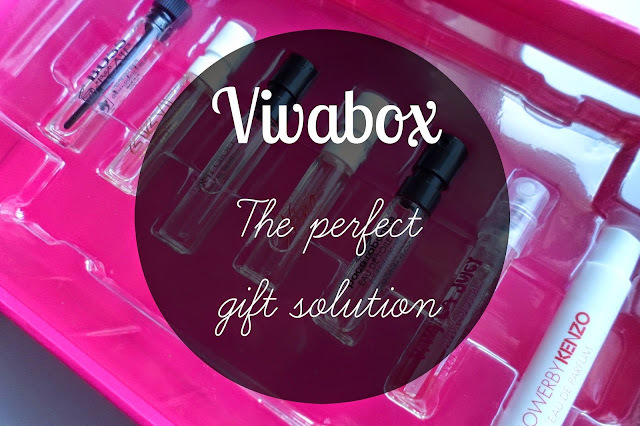 Vivabox is a fabulous idea which is the perfect solution to all those presents worries for both the men and women in your life! Try it, Choose it, Love it! Each box is full of a fabulous aray of 7 testers for the recipient to test and try out before picking out their favourite. Once they've decided which fragrance is for them all they have to do is take their voucher which is found inside the box to their nearest Perfume Shop and they can exchange it for one of the full size products! All the scents choosen are really different from each other so there is definitely going to be something for everyone for sure! Obviously I was super excited to delve straight into this! I am a big perfume person and I am always on the look out for more. I'm not one of these people that has a signature scent - as much as I wish I was! I'm always chopping and changing to my mood and the occasion, but there's nothing wrong with that! What samples will I find in the ladies Vivabox? Well the boyf was impressed with this one! I have bought a few fragrances for him over the years and 9 times out of 10 I think I've got it right and he's liked it but this is a great way for him to be able to choose something for himself without having to drag him to a shop to spray a million different testers! What samples will I find in the men's Vivabox? Overall I am so so impressed with this idea from the people at Vivabox and I really can't fault it! A gift you buy but they choose - a win-win situation all round! The only problem for me is that the nearest Perfume Shop to me is a boat journey away but I'm sure most of you guys aren't far from one at all! Have you seen these before? What fragrance would you pick? They are such a great idea - love that it's him and hers.